Back in the pre-internet era, the local hardware store sold residential mailboxes. For business mailboxes, though, you’d have to pore through a massive catalog with tables full of dimensions and print so small you needed a magnifying glass. Today, there’s an easier way. U.S. Mail Supply not only shows you all the specs on the mailboxes we sell, we also show you what they look like and are available to answer any questions you have. Whether you’re looking for a single, wall-mount mailbox to put outside your home or a cluster style mailbox for an apartment or office building, you’ll find it here. We only carry top-quality, American-made mailboxes, so you can count on your purchase providing many years of trouble-free service. If you need help figuring out what mailbox will work best at your location, or if you have questions about any of the mailboxes we carry, give us a call or email us. With the mail pilfering crimes on the rise, a secure mailbox is more important than ever. 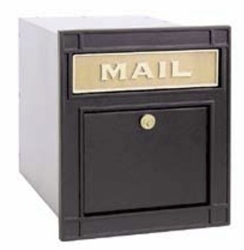 U.S. Mail Supply only carries quality-built, American-made mailboxes with secure locks. We have both USPS approved and private use only mailboxes in all sizes and configurations, with the option to customize a configuration for your specific needs. 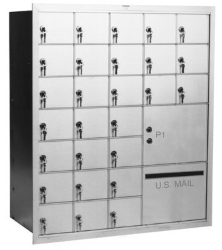 The modular design of the 4C mailbox allows for many different configurations of mail slots and parcel lockers. 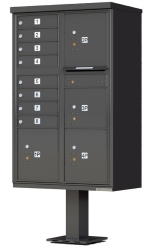 In addition to offering an incredible amount of flexibility in how they’re configured, these mailboxes are also available in a wide range of powder coat finishes to blend in well with virtually any color scheme. The United States Postal Service has very specific requirements mailboxes have to meet if you want your postman to deliver and pick up your mail. 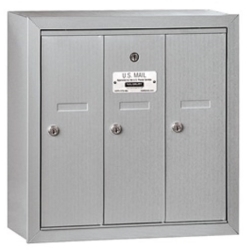 U.S. Mail Supply carries an extensive line of USPS approved mailboxes for both homes and businesses—all built in the USA with heavy gauge aluminum and steel for durability. Whether you need USPS approved mailboxes or private use only mailboxes, look to U.S. Mail Supply. 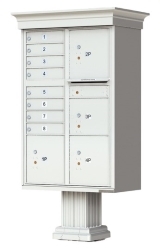 Indoor and outdoor mailboxes, wall mount, recess mount, or pedestal mount—we have them all. Every mailbox we carry is made in the USA, equipped with secure locks and finished with a tough powder coat finish. Utah is home to some of the best skiing in the country-- great for skiers, but not so great for mailboxes. Besides the snow, there’s the inevitable splatter of pebbles and ice melting pellets from snow blowers. That’s why U.S. Mail Supply only carries top-quality, built-to-last, mailboxes constructed with powder-coated steel and aluminum. Indoor mailboxes aren’t subjected to the elements, but they do have to endure having their doors slammed shut, random acts of vandalism, and attempted break-ins. A cheap mailbox you have to replace after a couple years is no bargain. 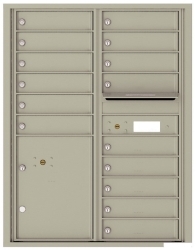 When you buy a quality-built mailbox from U.S. Mail Supply, you save money in the long run. We understand the temptation to buy the cheapest mailbox you can find, especially when there are so many other expensive household purchases on your list. Unfortunately, cheap mailboxes made with plastic or pot metal rarely last more than a couple years—which is why we only carry quality, American-made mailboxes from the get-go. 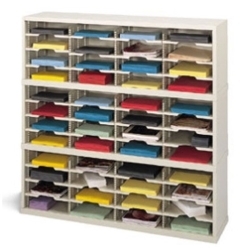 While they were originally designed for mail room use, mail sorters have become an essential organizational tool for businesses and schools. We stock only quality-built, American-made sorters. They’re available in both open and closed back versions, as well as locking, HIPAA-compliant models. U.S. Mail Supply is all about making your next mailbox purchase as easy and hassle-free as possible. Of course, wading through all the choices and making a decision may be the hardest part. Don’t worry, though, we’re here to help. 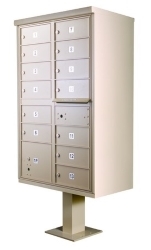 Have questions about a mailbox we carry? Need a recommendation for an awkward space? Don’t hesitate to give us a call. Our customer service reps are here to help in any way possible. Sometimes, a stock mailbox configuration just doesn’t work. If you have an awkward space and need something a little different from what you see in our inventory, let us know. We offer free custom design assistance to ensure you get a mailbox setup that will work for you. To get started, just click the option below that best matches the type of mailboxes you’re considering. You’ll answer some questions about your needs and preferences, then send your responses to us. Our designers will come up with a solution, create a rendering of how it will look in your space, and send it to you with a price quote.